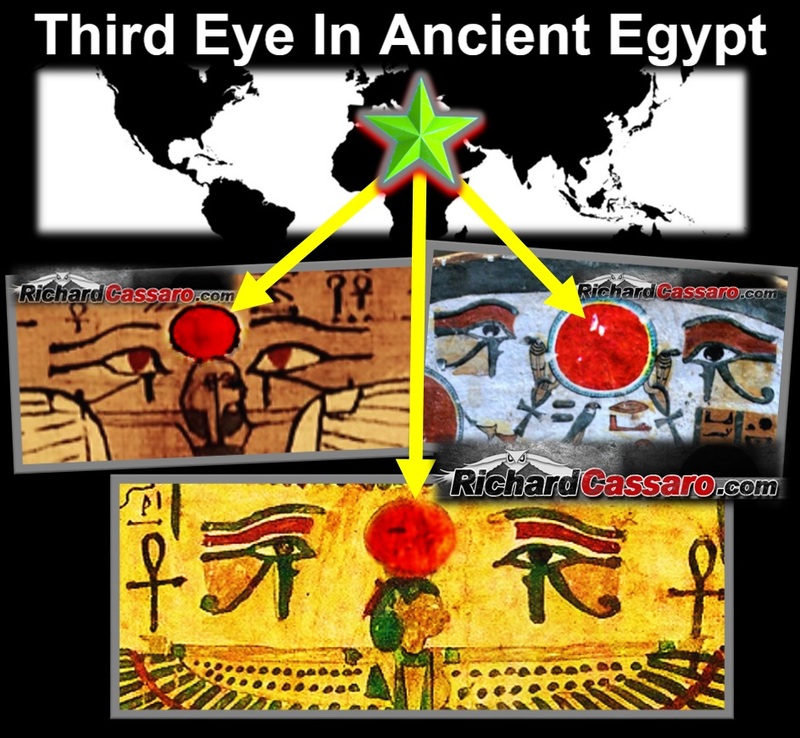 The spiritual act of “Awakening The Third Eye”—still taught in Eastern traditions like Hinduism—was the central doctrine of the ancient Egyptian religion for thousands of years. 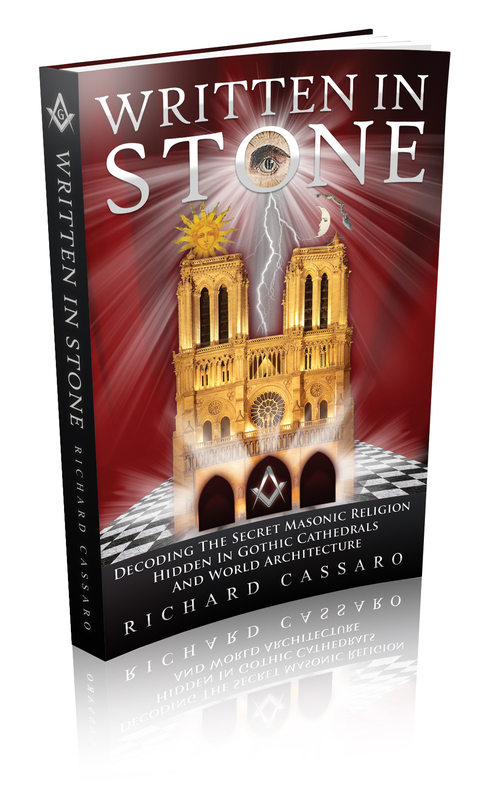 I have been presenting and explaining Third Eye symbolism in Egypt online for many years; you can learn more about my perspective in my 2011 book, Written In Stone. This article is an abridged version of a chapter from Written In Stone. We’ve been told that the Egyptian culture was a culture of fear and death—the Mummy’s Curse, the forced enslavement of the Hebrews, serpents, plagues, and the egotistical Pharaoh. But my lifelong study of Egypt has convinced me that there is a much sunnier side to Egyptian culture. The Egyptians were a people of life, not death. 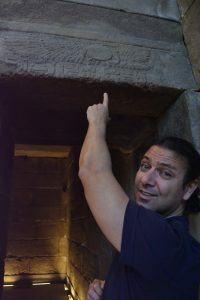 Most Egyptologists aren’t aware of it, but there’s a crucial “missing piece” that they’re not recognizing when it comes to the ancient Egyptian religion, and it played a central role in the artwork, culture and history of ancient Egypt for thousands of years. This missing piece is visible and present in the world’s oldest living religious tradition, the Hinduism of India, which was contemporary with ancient Egypt. It’s called the Third Eye, which has been a main subject of my work for more than fifteen years. The Third Eye is a key concept in Hinduism’s Kundalini Yoga, which teaches initiates to “balance” or “unify” our lunar ida left-bodily side with our solar pingala right-bodily side. 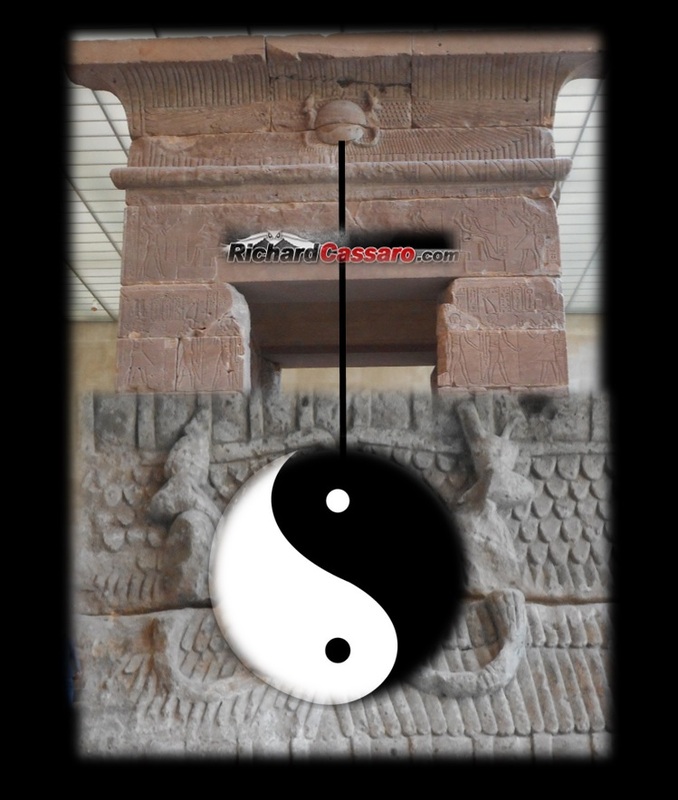 This “balance” or “unity” of our twin opposing natures makes us whole again—just as the balance or unity of China’s twin opposing Yin and Yang halves completes the perfect circle. 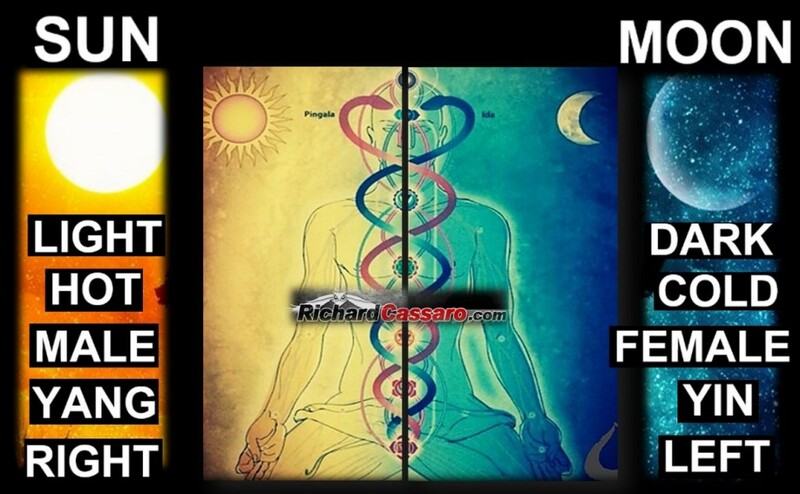 This “balance” or “unity” also awakens a serpentine power, which rises up our spine (through seven invisible “chakras” or energy centers) and activates a Third Eye hidden in our foreheads. Kundalini ascending through the seven chakras, by “balancing” the “pairs of opposites,” symbolized by the sun and moon in equilibrium. While many ancient cultures were still in their infancy, the Egyptians had already been creating mysterious images of a single Eye—the Third Eye—for centuries, if not millennia. 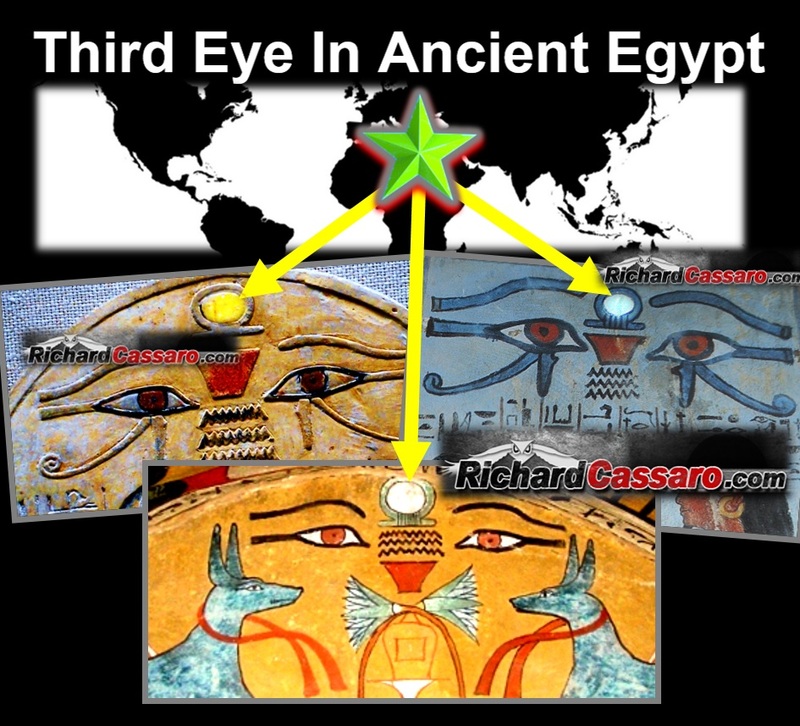 Egypt’s udjat Eye is identical to Hinduism´s Third Eye and Kundalini Yoga’s ajna chakra, which is still taught in India today. 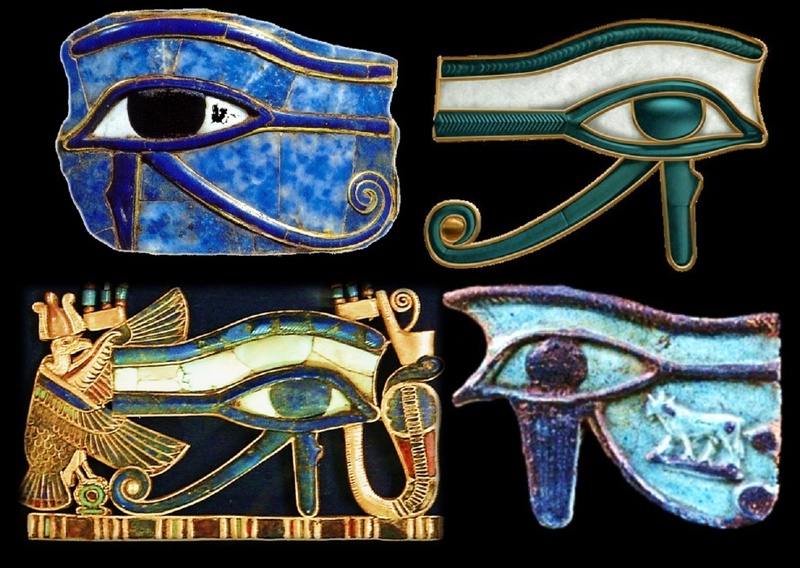 The single Eye icon, known to the Egyptians as the udjat, represents one of the greatest mysteries of Egyptology. For years, its meaning perplexed me. Hindus believe that enlightenment occurs when “serpent power” from the spine enters the brow. Normally, this enlightenment is represented in Hindu culture by an eye symbol on the forehead, representing the Third Eye. 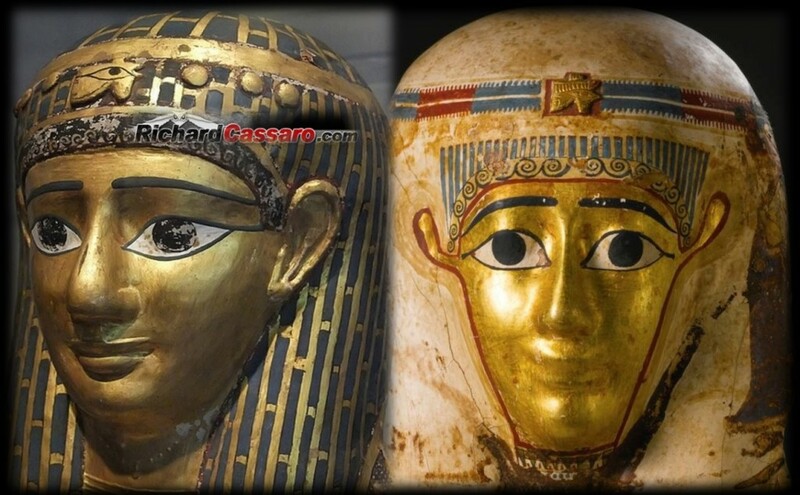 Some Egyptian sarcophagi depict the Egyptian Eye (udjat) on the forehead, in the same position as the Third Eye. I then realized that the Egyptians might have used exactly the same “forehead dot” as the Hindus to symbolize the Third Eye. As we can see in the images below, they did indeed. 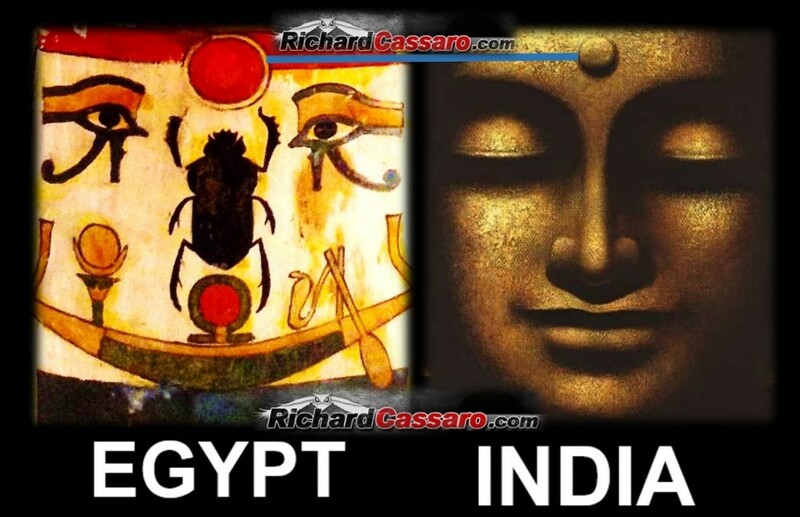 These Egyptian images depict what in ancient and modern India is called Kundalini yoga’s ajna chakra or Third Eye chakra. 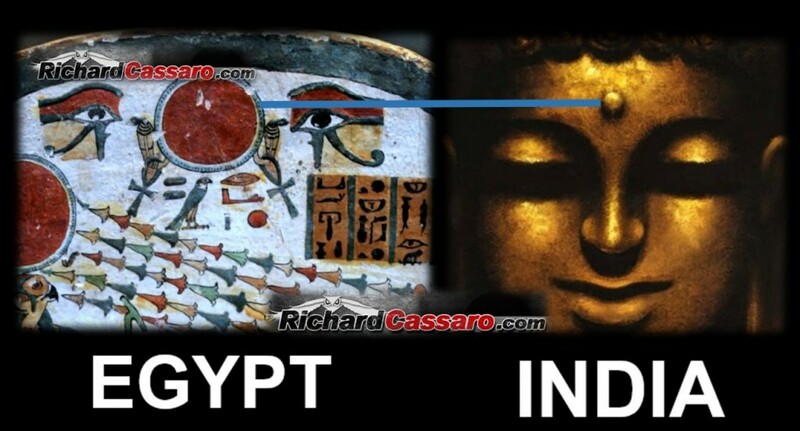 Visual comparisons of images from both civilizations make this overwhelmingly clear. As we can see, the Aten was often depicted as a Third Eye above and between the two eyes. 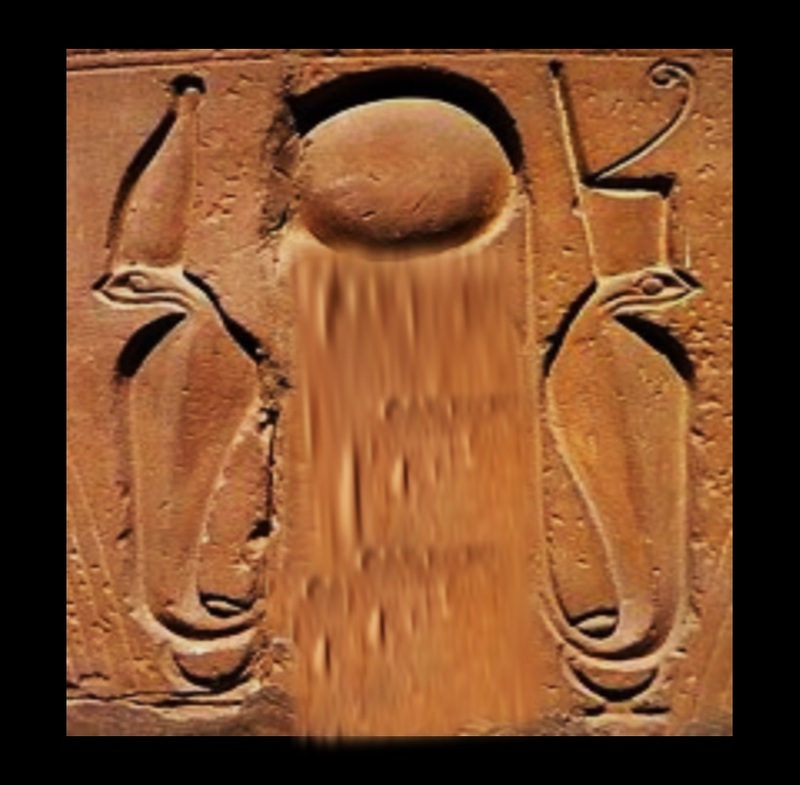 The Aten was sometimes encapsulated inside the Shen symbol of “eternity”. The Aten stands for the awakened Third Eye that sees the “soul within” or the “sun within,” and which “soul” or “sun” is really the “higher Self” or “divine spark” within us. The Aten is thus a symbol of both the Third Eye and the “Soul Within” that the awakened Third Eye sees. Only the most basic visual evidence has been presented thus far, and it overwhelmingly suggests that the Egyptians, like their Hindu contemporaries, believed in and practiced a spiritual custom hitherto considered strictly Hindu. 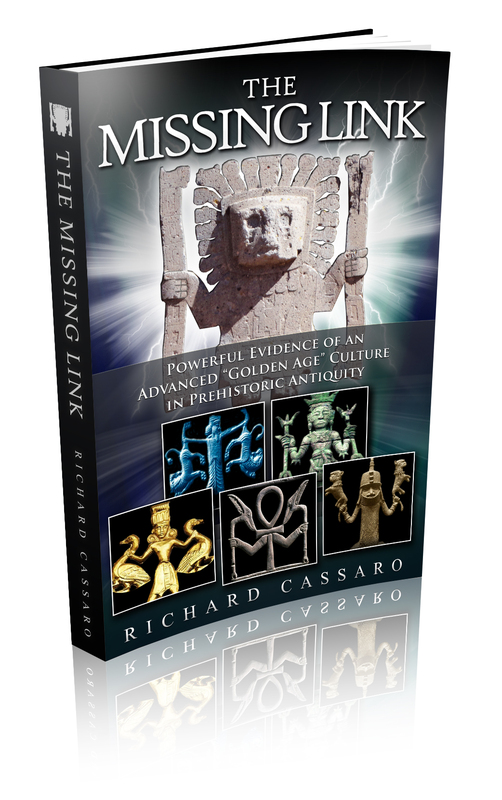 The visual evidence also illustrates that the Third Eye concept was much broader in antiquity than that hitherto understood, or accepted, by scholars. Left: The “altered” images, which have been digitally altered to omit the sushumna down the middle and Third Eye on top. The left-side / right-side equilibrium, which signifies the “pairs of opposites,” stands out more clearly. 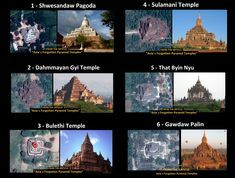 Right: The “authentic” images, where the sushumna is shown in the center, balancing and uniting the twin sides and awakening the Third Eye on top. 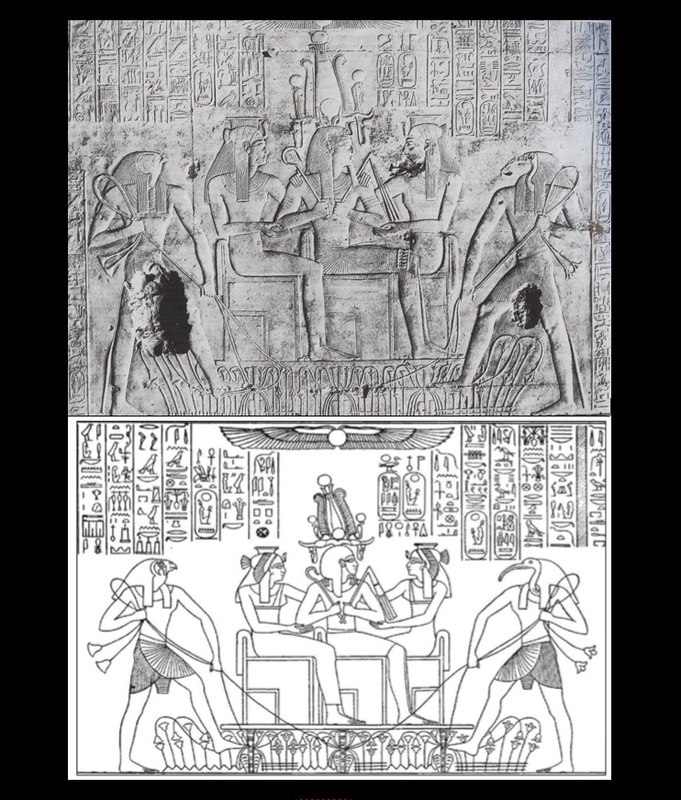 1 – The Egyptians understood duality. 2 – They understood that artistically this duality should visually take the form of “opposites in balance” (i.e., the right side “balanced” by the left). 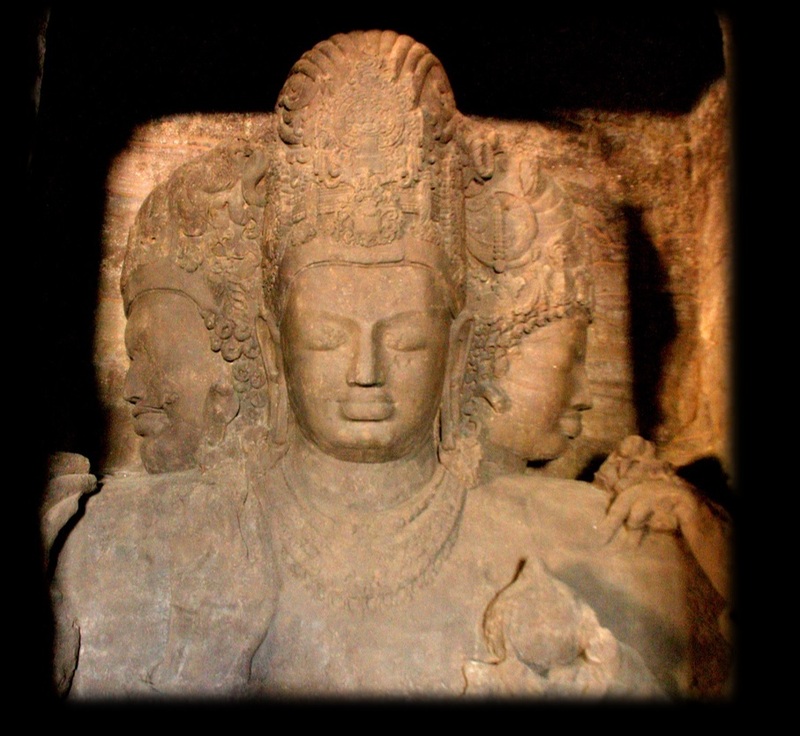 3 – They placed, in the middle and at the pinnacle of these “opposites in balance,” a “centered” Third Eye image. Dr. Richard Wilkinson, Symbol & Magic in Egyptian Art. The statue forms a three-in-one design, with a male on the right (sun, light, hot, yang, Jachin), paired with a female on the left (moon, dark, cold, yin, Boaz), which together flank a main “god” in the center, which faces forward (the eternal, spiritual you). Joseph Campbell, The Power of Myth. 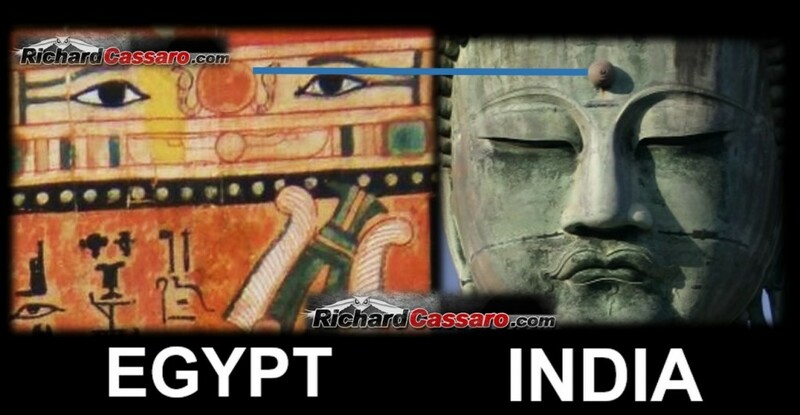 So for years, even scholars have recognized a perfect link connecting Egypt and India, not just in the Third Eye symbolism that these two ancient empires shared, but also in the philosophy of actual “duality” and “transcendence of duality” behind Third Eye symbolism. On a macro scale, the entire Egyptian empire formed a magical “balance of opposites”—a truth hidden in the geography of Egypt, and the actual flow of the River Nile. 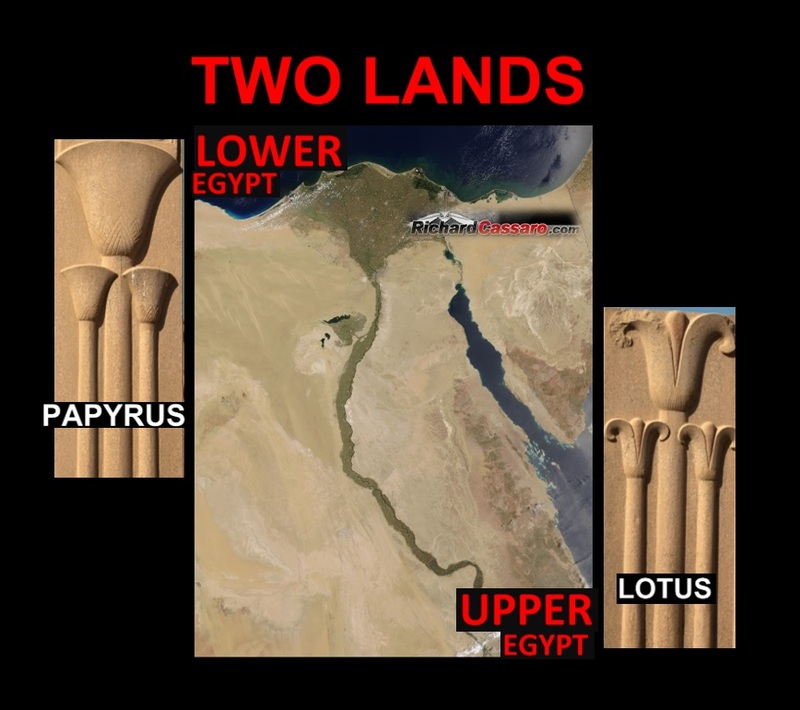 From time immemorial, the Nile has divided Egypt into a duality of “Two Lands”—so-called “Upper” and “Lower” Egypt. From Upper Egypt in the country’s South, the Nile flows downstream towards the Mediterranean Sea into Lower Egypt in the North. Upper Egypt is called “upper” because the land is elevated and closer to the source of the Nile in the highlands. Lower Egypt refers to the marshy swamps in the lowlands, where the Nile flows into the Mediterranean. J.E. Manchip White, Ancient Egypt. According to Egyptologists, a ceaseless rivalry encompassed the Two Lands from time immemorial. Upper and Lower Egypt were bitter rivals, always in opposition and conflict—i.e. as if they were perfect opposites. This is the doctrine of duality. All that is needed is the reconciliation power of the number “Three” to unite them. E. A. Wallis Budge, Osiris and the Egyptian Resurrection, Vol. I. Around 3100 B.C. King Menes (sometimes called King “Narmer”) of the South vanquished the King of the North and united the “Two Lands.” This is considered the single most important event in Egyptian history. R. T. Rundle Clark, Myth & Symbol in Egypt. Henri Frankfort, Kingship and the Gods. Thus, we see in the political landscape surrounding the union of the Two Lands of ancient Egypt the esoteric doctrine of duality, and the reconciliation of opposites. Narmer founded the capital city of Memphis precisely on the border between Upper and Lower Egypt. This laid the foundation for an era Egyptologists have dubbed the “First Dynasty” of kings, which followed in succession until the 30th Dynasty. 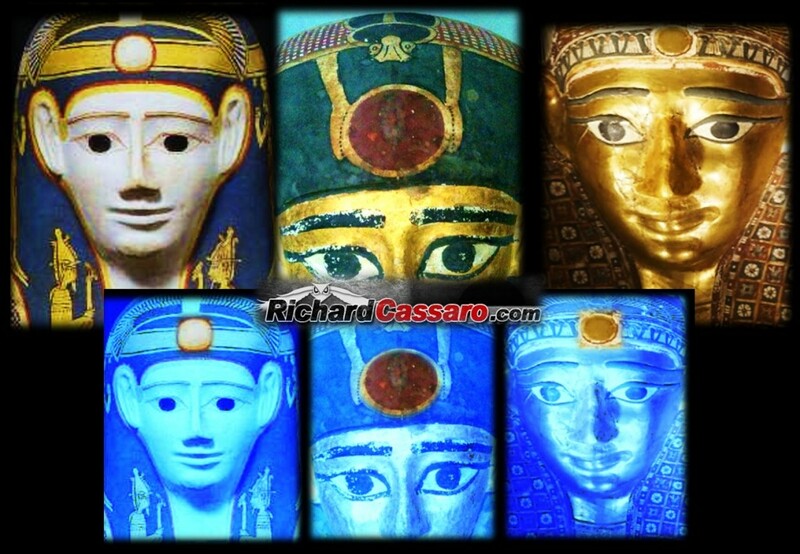 Together all the dynasties comprise the history of ancient Egypt as we know it. An Egyptian pharaoh soon became known as a “Lord of the Two Lands,” an appellation that continued until dynastic rule ended a few centuries after Jesus. 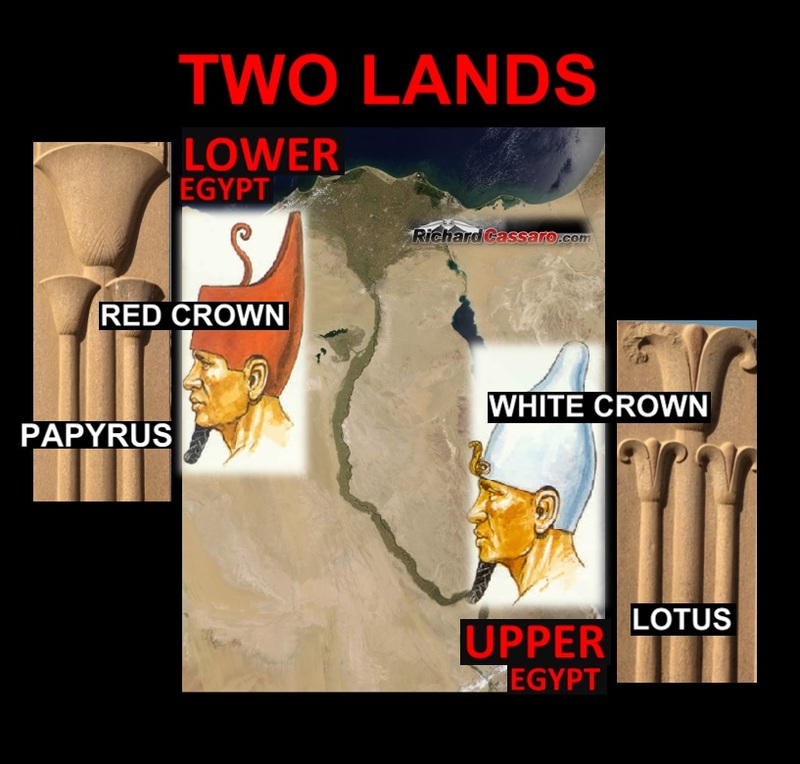 Egyptian Pharaohs soon became known as “Lord of the Two Lands,” an appellation that continued for thousands of years. Narmer also combined the twin crowns of Upper and Lower Egypt into a single crown, called the “Double Crown” or Pschent. Symbolically, this act was a magical operation akin to the Yogic “balancing” of the Ida and Pingala channels, to awaken the Third Eye at the apex. It was like the uniting of Yin and Yang to create the perfect Tao circle. Mark Lehner, The Complete Pyramids. This resemblance is uncanny. If this was intentional, the message is clear. Reconciling opposites (the Two Lands) opens the hidden Eye organ in the crown of the head. 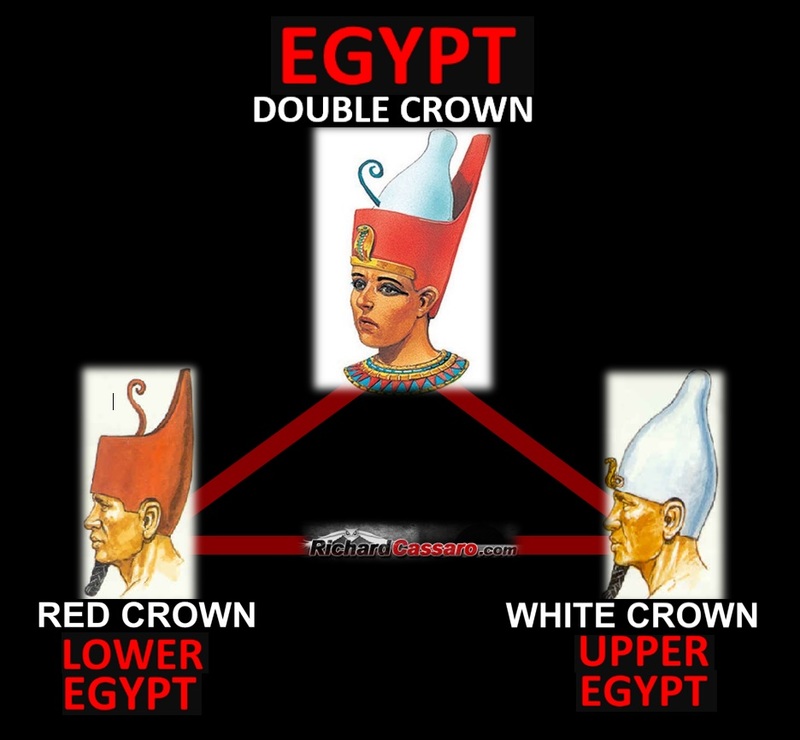 This idea is inherently logical because the “Double Crown” symbolizes a unity of duality (Two Lands), which is the way to awaken the Third Eye. Five prisoners facing one side, and five facing the other, in perfect symmetry. Also note the triangular image within the prisoners’ skirts. Senka-Amen-Seken’s lance pierces that triangle’s apex. The triangle seems to be a clue – that the prisoners are in perfect balance. Also note the round eyeball drawn inside the “Double Crown”. This was not artistic license on the part of the artist for Budge’s book; that eyeball is evident on the actual reliefs, friezes, and stone carvings themselves. 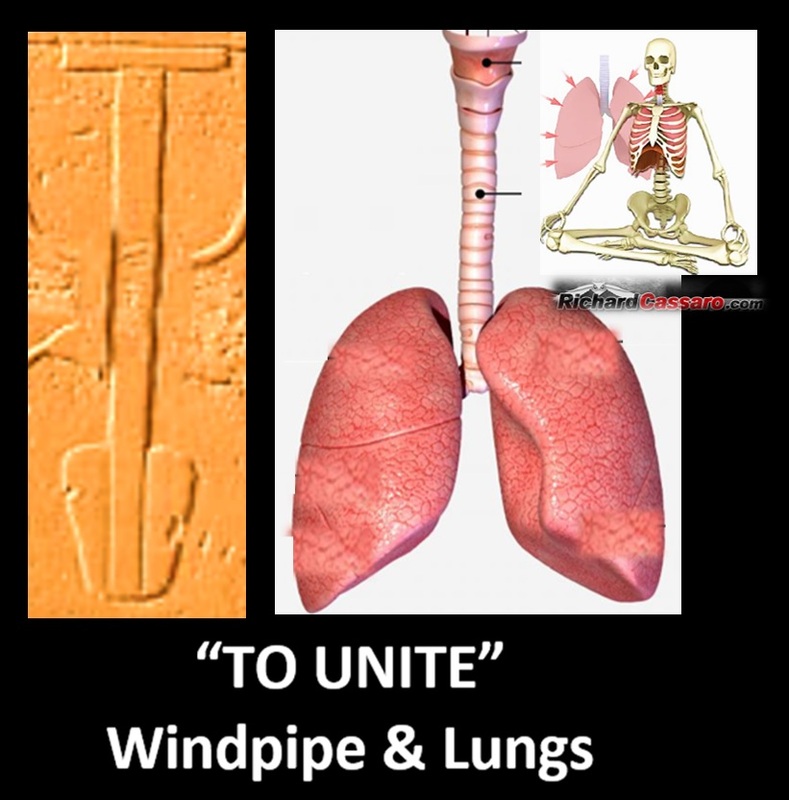 A windpipe was chosen because the windpipe is vertically centered between “twin” lungs—a perfect “three-in-one” or “balance of opposites” symbol. This is interesting because in Kundalini Yoga the art of “finding our center” by “unifying opposites” is achieved by meditation and breath control. 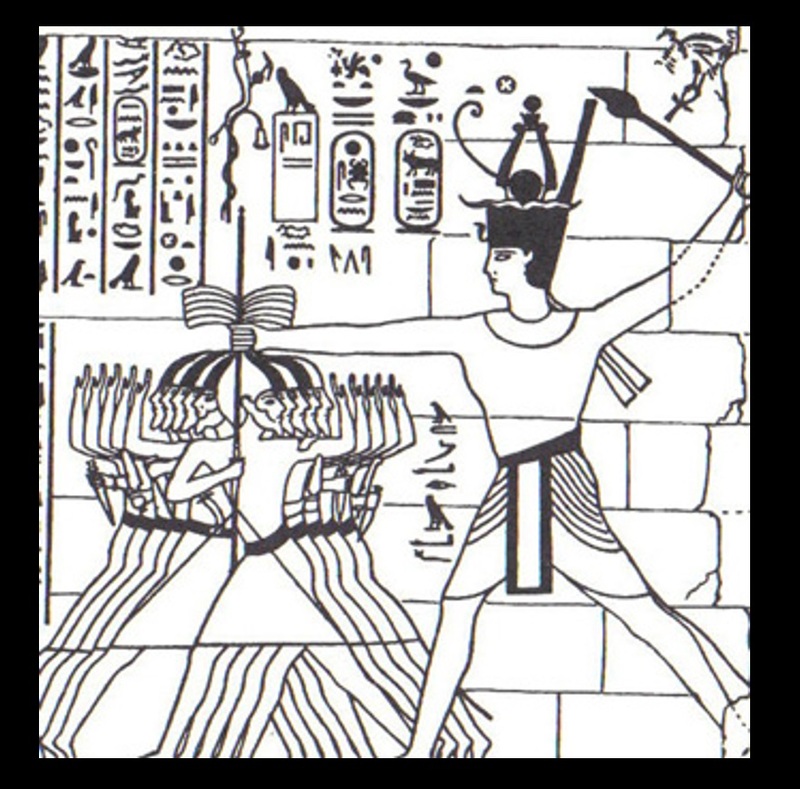 Sema Tawy, depicting Papyrus and Lotus tied to each other. 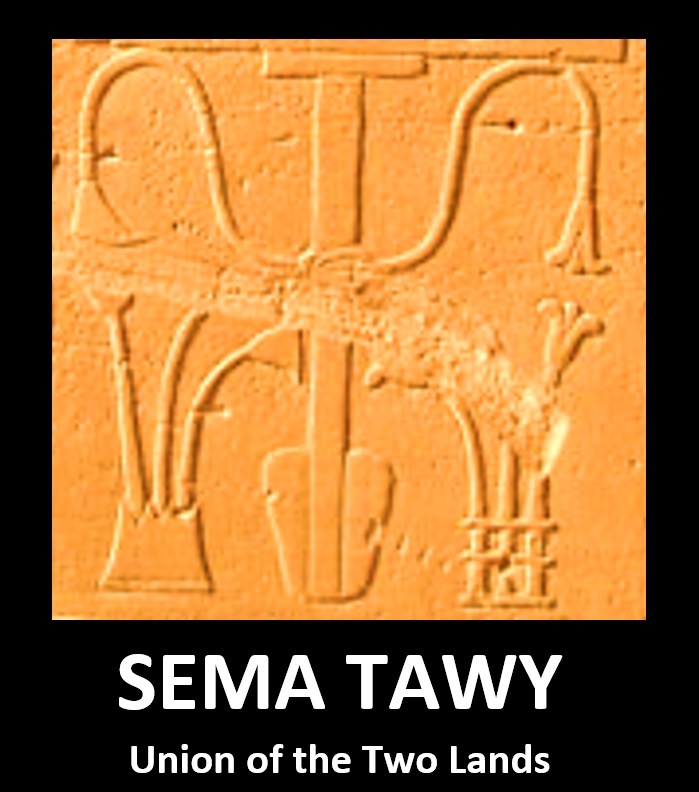 This “Union of the Two Lands” hieroglyph is called Sema Tawy, and it’s a perfect symbol for the “Balance of Opposites” or “Unification of Opposites.” This, according to Egyptian teachings, is the Great Work we must all perform, in order to find our center, and to awaken our true divine Self. Alvin Boyd Kuhn, Lost Light. 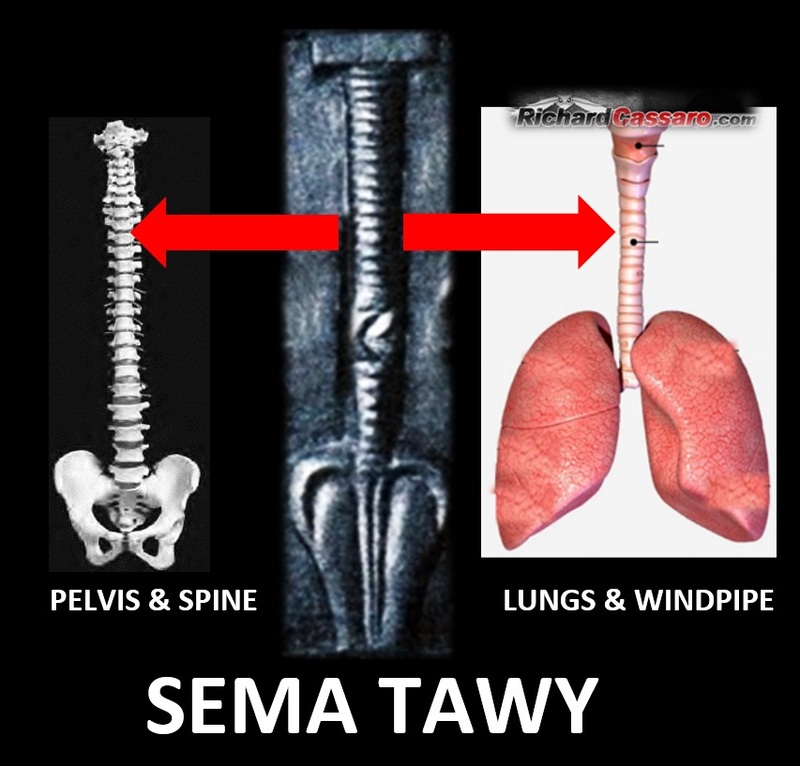 In this interpretation, the Sema Tawy depicts not just one, but two parts of the human anatomy: the “lungs/windpipe” and the “pelvis/spine” simultaneously. Both are, as discussed, associated with Kundalini Yoga. Viewed this way, and with the Lotus/Papyrus opposites attached on either side, this glyph depicts a roadmap and/or set of instructions to awakening our Third Eye, by balancing the right and left sides of our body through breath control, and by raising the sexual energy from our pelvic region up our spine, and towards our head. This is an ancient representation of the process of unifying opposites! 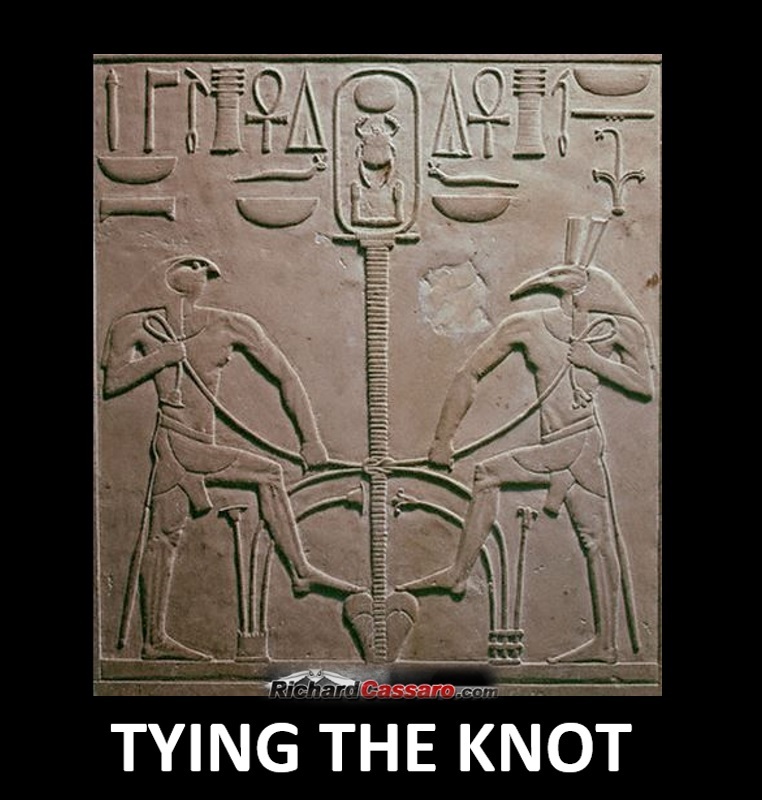 Together, twin beings tying the Sema Tawy signify “balanced duality,” which is why they’re depicted symmetrically, as “tying the knot,” in a kind of “alchemical marriage” of Male/Female, Right/Left, Light/Dark, and all the other pairs of opposites. Horus and Set (twin contraries) binding the plants of Upper and Lower Egypt. Representation of Sechat from a bas relief at Abydos. We’ve come full circle! 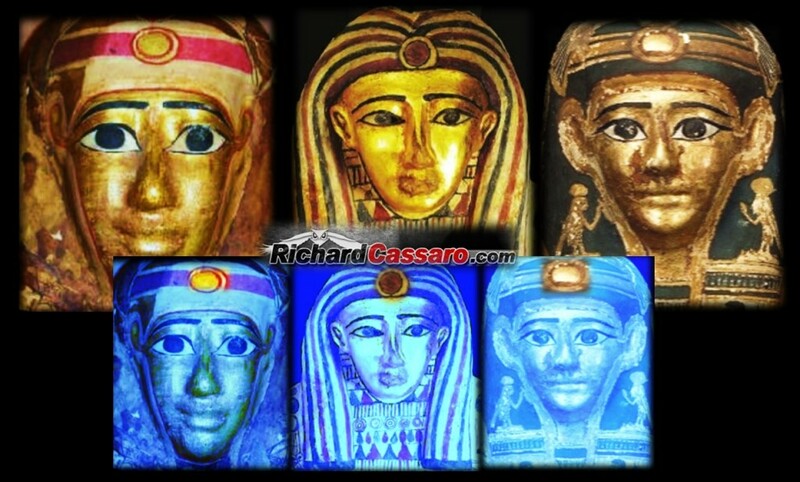 We are back to the Aten depicted on top of each portrait. 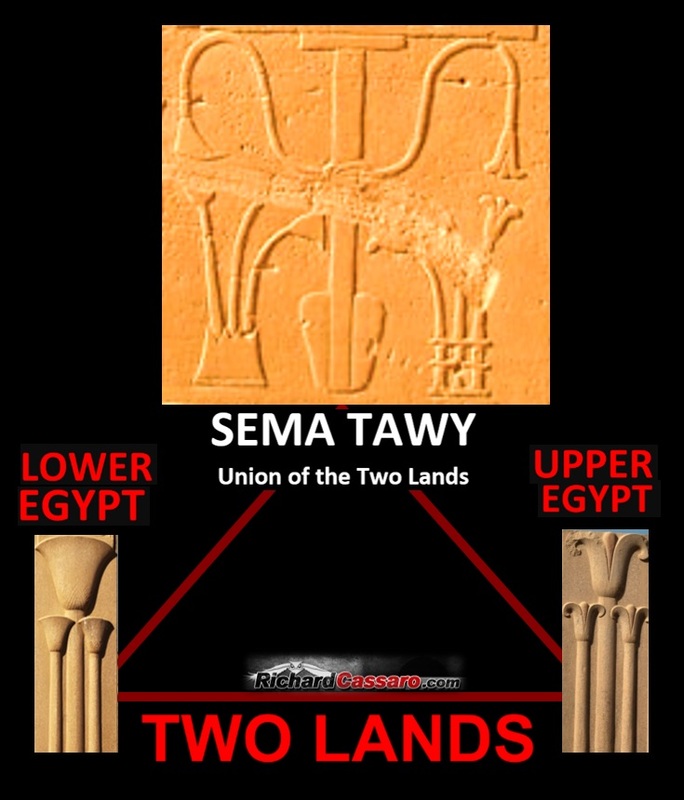 Why is the Aten aligned directly above the Sema Tawy? The Aten is aligned directly above the Sema Tawy, because the Aten is the symbol of the Third Eye, which awakens when we “balance” or “harmonize” the Two Lands of Upper and Lower Egypt—the very idea being expressed by the “tying” of the Sema Tawy! Adolf Erman, Life in Ancient Egypt (1894). Wallis Budge, From Fetish To God in Ancient Egypt (1934). This conventional explanation of Egypt as a sun-worshipping culture that laid the foundation for more “advanced” monotheistic religions has stubborn roots. Since Egyptian civilization paved the way for Western culture, the argument goes that its religion must be in some meaningful way consistent with Christian and Islamic teachings. Hogwash! In my opinion, this attempt to explain the past by saying it contained the seeds of the future makes no sense; this is yet another example of the arrogance of Western imperialist and Orientalist dogma. These Oxford dons and TV stars falsely claim the title of dispassionate scholar; they are more like the winning generals who write the one-sided history of the war in which they triumphed. In their haste to make Egyptian religion into the venerable ancestor of Islamic and Christian beliefs, with the place of the Sun-God Ra taken over by the monotheistic external God, mainstream Egyptologists have missed almost everything important about Egyptian religious practices! The world we see on the “outside” is but an echo or reflection of the world that exists “inside” ourselves. Conflicts or problems that appear “outwardly” in our lives are real-world manifestations of inner imperfections. Problems, then, are not really problems, but symptoms that manifest outwardly, telling us where to focus our attention – inward – in our continuing engagement in the Great Work. By showing scenes like that of Sechat at Abydos, the Egyptians were hoping to influence the interior world; the inner world; the world within themselves—like a mandala. By creating a kingdom of balanced duality on the outside world, they were trying to mimic the conditions that they sought within themselves. This is the secret of seeing with the Third Eye. 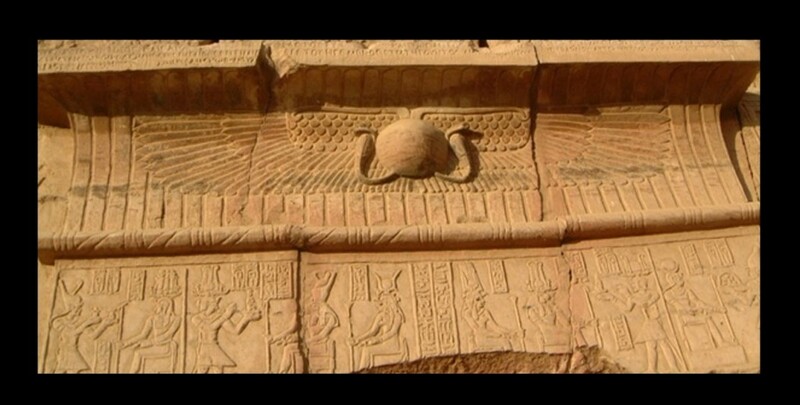 The “circular” Aten or ”Sundisk” symbolizes the “soul within.” The circle, with no beginning and no end, always symbolizes eternity and things eternal. 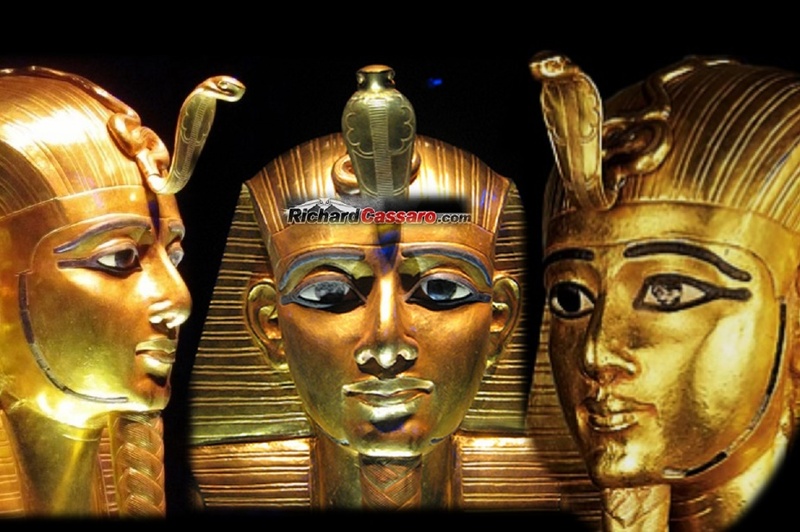 The serpent of Upper Egypt, wearing the White Crown, parallels Yang. The serpent of Lower Egypt, wearing the Red Crown, parallels Yin. And just as Yin and Yang are encompassed by the Tao circle of eternity, so the Aten circle organizes Egypt’s twin serpents into a higher unity, balancing them in perfect equilibrium. In addition to being depicted on the Egyptian forehead, the Aten always crowned the facades of Egypt’s Triptych Temples. 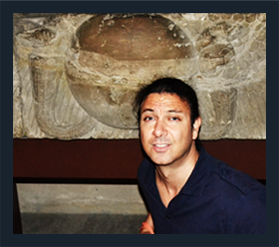 Egypt’s Triptych Temples with the Aten (Third Eye) crowning the center doorway. 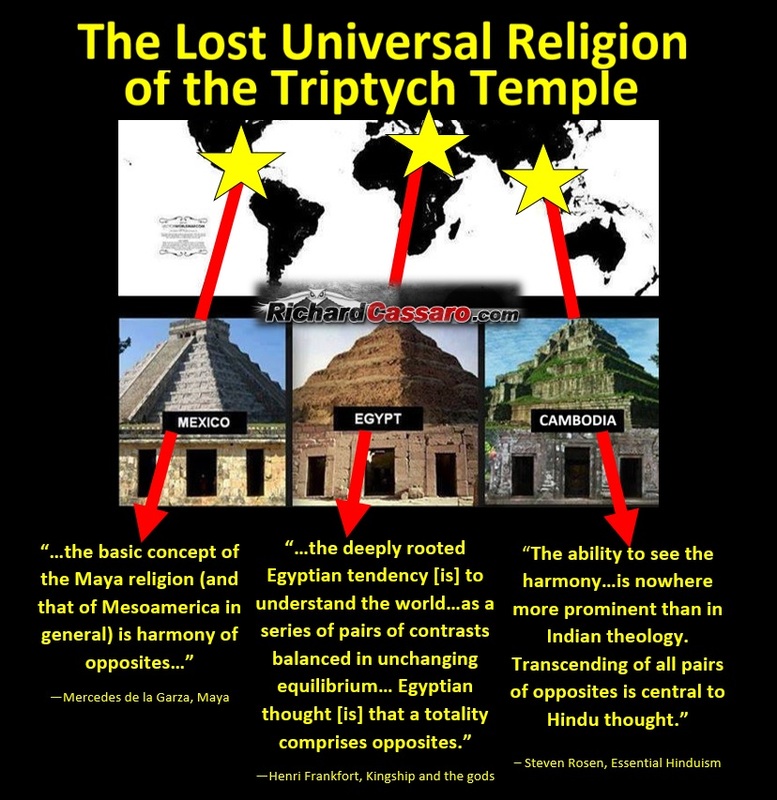 It’s not hard to envision these as temples dedicated to Third Eye awakenings. The twin serpents match the twin outer doorways, and the Aten’s circle matches the centered door. 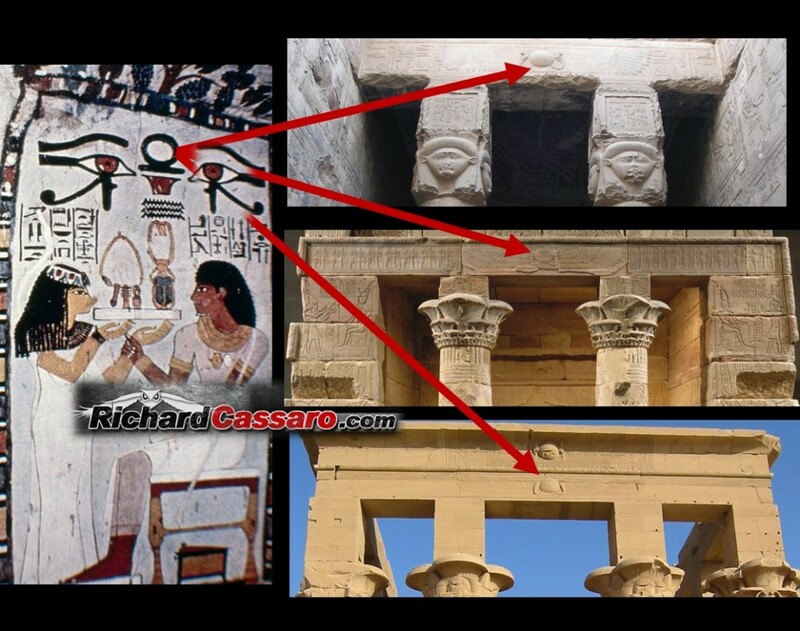 The middle door is centered and enlarged, revealing its higher importance.To those of us who have a basic knowledge of yoga, these Third Eye representations are so pervasive in Egyptian symbolism that any denial or minimizing of this fact seems like a deliberate cover-up. This appears to be happening in academic circles, considering discussion of the Third Eye in Egypt stretches back more than a century. 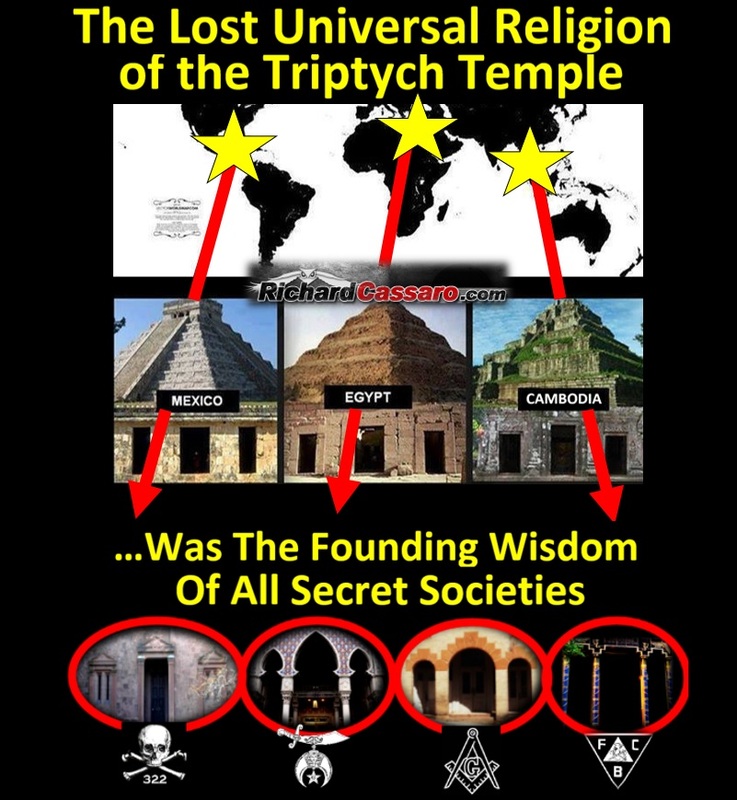 It started with Madame Helena Blavatsky and her acolytes, who were among the first to nail down this connection. René Schwaller de Lubicz and his wife Isha made practically a life’s work on this very subject, and Manly Hall discussed it in his research. Edgar Cayce also gave readings linking Kundalini yoga and Egyptian Third Eye practice. 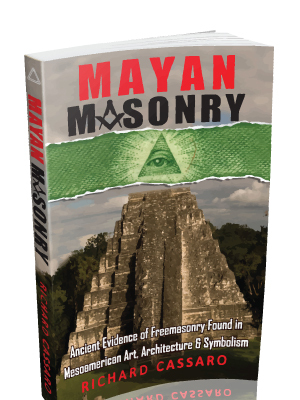 In recent years, authors John Anthony West, Gary Osborn, and Drunvalo Melchizedek have embraced this tradition. Within this article, I have limited myself to pointing out matter-of-factly, with the use of solid photographic evidence and iconographical explication, that much of Egyptian religion and Hindu practice is identical. Studying Sanskrit and Hindu Philosophy would, therefore, be an invaluable way of coming to grips with the true nature of Egyptian religion, rather than focusing mainly on making sense of the Book of the Dead. 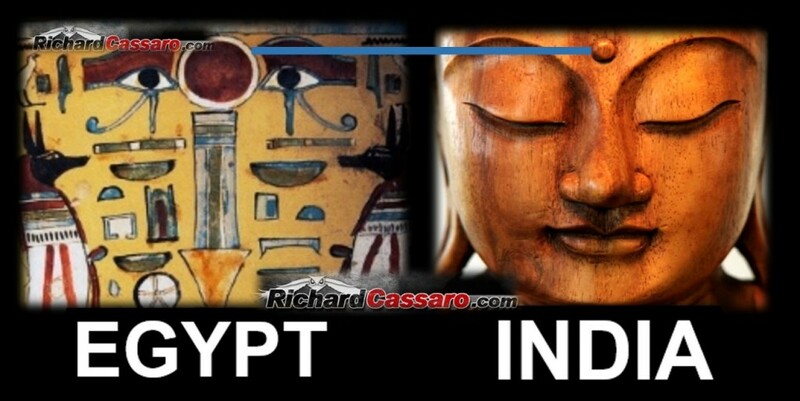 Third Eye worship in Egypt is real. It seems to me that Egyptologists are ignoring an elephant in every wall painting, every papyrus scroll, and every monolithic work of architecture. Ironically, it’s for precisely this reason that few Egyptologists see true insight and human wisdom in the Egyptian religion. In their view, Egyptian deities, myths and symbols are all external; signifying another person, place or thing, rather than for what they truly are—internal, symbolic of our own lives, our own destinies, and our own human condition. Applied properly, it’s this internal method that will allow us to decipher the symbols and iconography of Egypt and apply its wisdom to our own lives. The outdated idea that the Egyptians were “sun worshippers” (in the sense that modern Egyptology supposes) should be discarded. The Aten was a symbol of the Third Eye in Egypt and the soul within us that the awakened Third Eye sees. 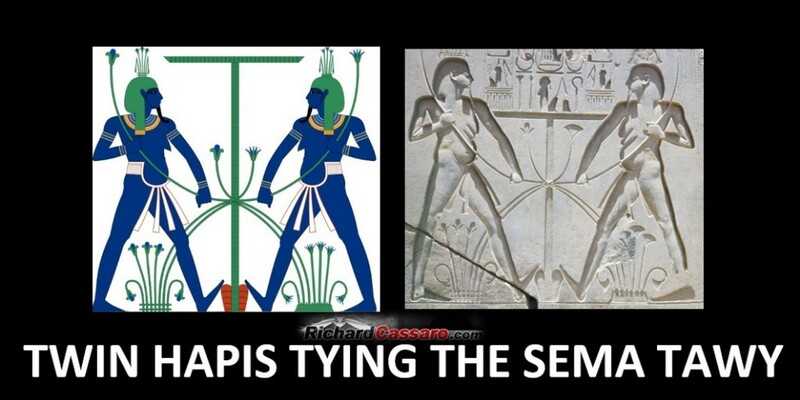 This is the great secret of the ancient Egyptian religion.